The cordyceps has long been treasured as a precious health supplement affordable only to the royal court. It has long been used as a natural tonic to strengthen vital essence and for promoting longevity. Traditional valuable Chinese herbal tonic containing cordyceps sinensis mycelia. Each 500mg product contains extract of the Cordyceps Sinensis Mycelia Powder 500mg. Before or after breakfast / dinner. 1-2 capsules twice a day. 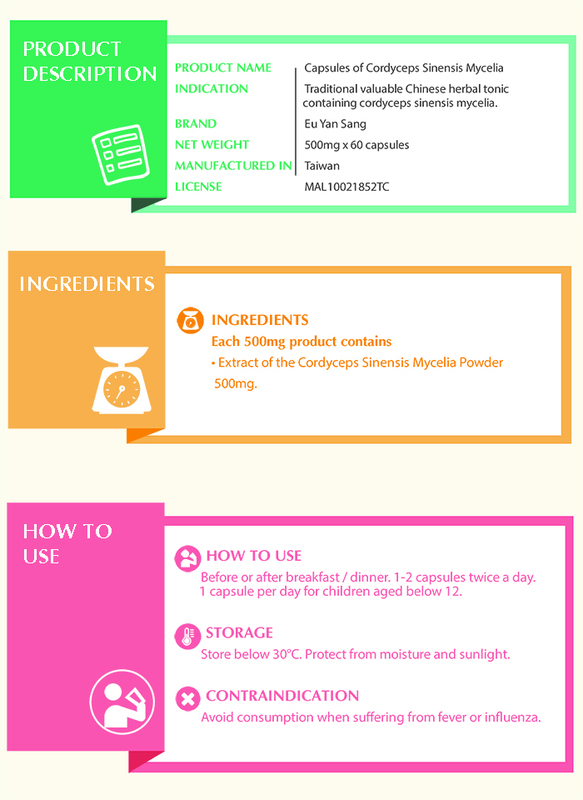 1 capsule per day for children aged below 12. Avoid consumption when suffering from fever or influenza. TCM adopts a natural & comprehensive method to treat various male-related health issues.